Oh I can’t believe it has been two weeks since I have posted a card. I’ve been so busy with family visits and summer happenings. I have nine birthdays between the end of July and the end of August. 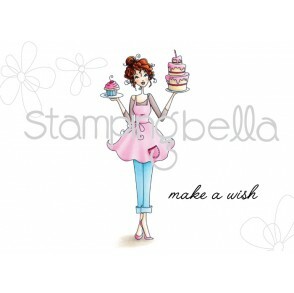 I used Cakeabella, one of the stamps from the last release at Stamping Bella to make a card for my niece. I used my Copic markers to color her up. I used the matching die to cut her out and added dimensions to pop her up. In the July card kit from Simon Says Stamp, there was a stencil to create fireworks. After applying my ink, I added a layer of Wink of Stella to add some sparkle to the fireworks. I layered the fireworks on some patterned paper that I had in my stash and added the sentiment from the Cakeabella stamp set. I didn’t add anything else to the card as I wanted to keep it simple. Nancee, this is a Gold Medal standard card! Love it.